Indignity and forgiveness in Robben Island. August. 29, 2018 07:40. .
One day, they told a man to dig in the ground. Once he did so at their command, they made him to go inside the hole and lie down. At the moment, he thought that he would be now killed. However, they unzipped their pants and started to pee on him. The place where such an extremely insulting act took place was Robben Island of South Africa. “They” were white prison guards, and “he” was prisoner Nelson Mandela. Guards were aware that Mandela was a leader who had commanded respect from other prisoners, and intended to dampen his spirits. Going through such indignities in prison, an ordinary person might have grown desperate to get revenge on them. Mandela, however, had neither anger nor resentment when he was released from prison after serving 27 years. He even invited one of the white guards who used to supervise him to his inauguration ceremony as president. It was a surprising gesture of forgiveness and reconciliation. What is it that made him so generous? Was he inherently an understanding person? Not exactly. It was pain that made him tolerant. When moved to Robben Island after sentenced to life imprisonment, Mandela was rather a combatant filled with rage. Whites did not treat black Africans as fellow human beings, and the law, even if in existence, could not be farther from justice. It was only natural for him to grow furious. 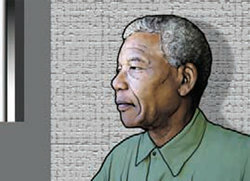 Still, long years locked in solitary confinement taught him forgiveness and tolerance, giving him an opportunity to “reflect on his own behaviors, and get rid of bad habits while developing good ones.” The future president of South Africa realized that his country would have no future without forgiveness. What would have happened if Mandela responded to the violent acts committed by Whites in kind? It must have invited a vicious cycle of violence where an eye for an eye, a tooth for a tooth rule applies. In the end, forgiveness was future. Forgiving something that never seemed forgivable was mercy in its true sense, and future as well. What Mandela practiced was a marvelous politics of forgiveness.